Two area shootings, a cold-blooded murder and a crash on I-95 that shut down traffic for hours, may have been caused by a man with no prior criminal history in Florida. According to the Palm Beach Sheriff's Office, 22-year-old Hugo Selva shot and killed a woman outside a Lake Worth convenience store on Wednesday morning. Selva was later killed by a deputy after driving the wrong way on I-95 and causing several wrecks. Deputies identified the dead woman as 26-year-old Nicole Novak. According to Facebook, Novak and Selva were in a relationship. Facebook shows Novak was a new mom, but it is unclear if Selva fathered the child. State records show Novak has a long list of drug-related charges, and was on probation for drug-trafficking. Selva does not have a criminal history, but records in Palm Beach county show he had a history of making violent threats against family members, and a drug and alcohol problem. Contact 5 Investigator Merris Badcock watched surveillance video of the shooting outside the Lake Worth convenience store off S. Dixie Hwy. Video shows Novak and Selva in the store together. They walk outside arms around each other. Moments later, and without warning, Selva shoots his girlfriend in the head at point blank range. "He went to panicking. You know, when you do something, and then you regret you did it," said Melissa Massena who works next door to the convenience store. "I guess he kind of regretted what he did, picked her up, threw her int he car, and drove off like a maniac." According to the surveillance video, several witnesses tried to stop Selva from driving off, but they were unsuccessful. Shortly after, Selva was entangled in a crash on I-95 after driving the wrong way on the interstate. Deputies say he hit three cars before his black Nissan Rogue crashed and caught on fire. A PBSO deputy who responded to the scene, and was 'in fear for his life', shot and killed Selva. That deputy has been identified as Connor Haugh. The sheriff's office says he has been with them for almost two years. Prior to that, he worked for Boynton Beach police from 2005 to 2016. He is currently on administrative leave which is standard procedure. 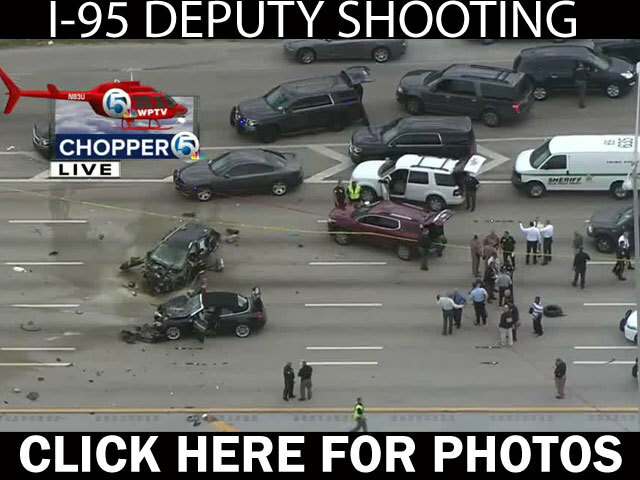 Contact 5 found that Haugh was involved in another officer-involved shooting in 2008, while he was an officer in Boynton Beach. Haugh opened fire when two carjacking suspects tried to flee the scene. No one was injured, and the two suspects were arrested in that case. Selva was tied to an early shooting in Boynton Beach and a shooting the day before in West Palm Beach. Detectives in West Palm Beach confirmed Selva used to buy marijuana from the man he allegedly shot outside the Dutchman Motor Lodge. Boynton Beach police identified the victim in the shooting they are investigating as 21-year-old Anthony Fonti. Both of the prior shooting victims are expected to be OK.